Boy Likes Girl. Boy Buys Girl Nissan. Girl Doesn't Like Boy. Girls Sells Car On eBay. 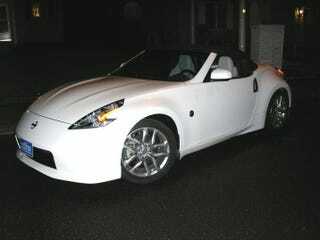 According to the seller, this Nissan 370Z Convertible was purchased for his daughter by a wealthy admirer. Unfortunately for the amorous Nissan fan, the girl is "not a fool and decided the boy was." Ouch. Save $5,000 over new by buying this slightly used Nissan 370Z. Touring package includes leather seats, 8 way adjustable driver's seat and & 4 way adjustable passenger's seat, tilt steering wheel, remote mirrors, 8 speaker Bose stereo, Bluetooth system, Homelink transmitter (garage door) cruise control, power windows & locks, auto dim rear mirror, audio controls on steering wheel, XM radio, 2 D/C power outlets, Traction control active head restraint, seat mounted and head side air bags, 332hp engine w/ 7 speed with paddle shiftersaluminum hood, three cup holders, splash gaurds, illuminated kick plates, heated mirrors, heated & cooled seats. The car was bought new in Oregon late last year by a young man that thought he could influence my daughter's affections by giving it to her as a gift. The only problem was, my daughter is not influenced by material things and she has way too many friends to be happy with a two seater. She is also not a fool and decided the boy was (far too wealthy) and she could use the money. So she told me (Dad) to sell it so she could use the money more wisely. The young man liked the looks of the 2010 Nismo front spoiler so he had a body shop install it on the car. Everything is in excellent condition inside & out. Call if you have questions (after 6PM: 503-837-0868 or 208-651-6433. The car is in Oregon but it can be delivered for a fee to No. CA, Oregon, Washington, Idaho or eastern Montana. I will need a $2,000 deposit (non-refundable) within three days of the sale. Please do not bother me with low ball offers and I do not want to trade for your really nice whatever. There's something kind of presumptuous about buying a car for a girl who (apparently) doesn't like you and just expecting her to fall for you. Of course, there's also something a little cold-hearted about accepting the car, rejecting the boy and turning around and selling it.